One of the highlights of my recent trip to Washington, DC was a visit to the National Geographic Museum to check out the sensational Birds of Paradise exhibit. 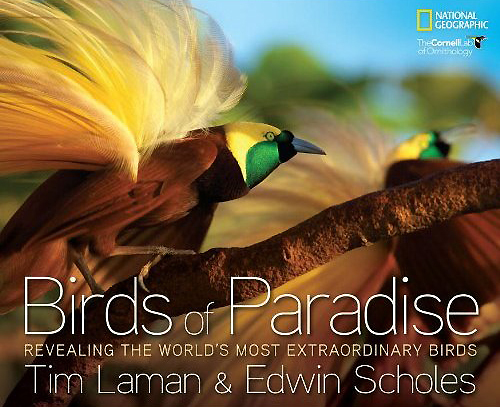 It took 8 years and 18 expeditions to New Guinea and nearby islands for Cornell Lab scientist Ed Scholes and National Geographic photographer Tim Laman to capture images of all 39 species in the bird-of-paradise family for the first time ever. In this short video clip, the Magnificent Riflebird Bird-of-Paradise male displays to female. Watch him shapeshift and rapidly swing his head back and forth, alternately hiding it behind one wing and then the other. How he makes the loud swishing sound with his wings remains a mystery. Tim estimates that it took them about 80 hours to film this from 2 blinds. And he says, “That is a lot of time to sit in a dark hut being attacked by mosquitos…” But as you can see, it was worth it to capture this amazing display. Don’t be afraid to strut your stuff! Learn more about the Birds of Paradise Project, and check out Tim Lathan’s blog for more amazing photos, videos, and wildlife diaries. Thanks, Kim. I need practice!